If a stock breaks an uptrend line, it can be a bearish reversal pattern. The bullish momentum has shifted and you should be very careful. Not all trend line breaks will result in a change of trend. But most trend changes often begin with the breaking of trend lines. 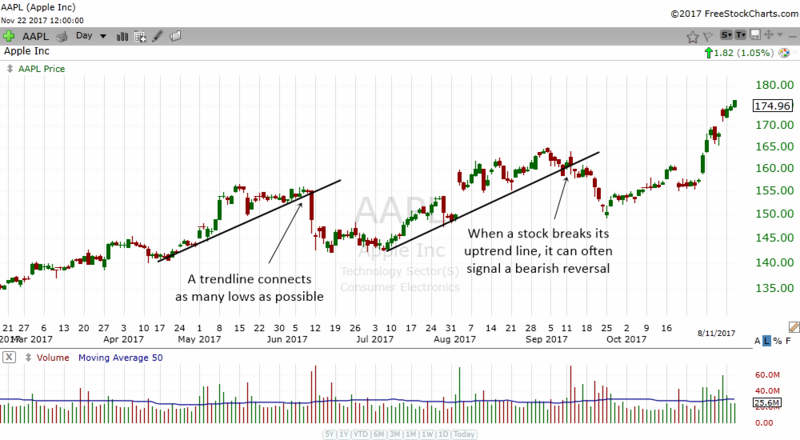 If your stock has been going up nicely, you can often draw a trend line to connect the lows of the price pattern. Then you should monitor the trend line carefully and see if there is a break. A trend line is just a simple line that you draw to connect the lows in a rising stock. I guess a picture is worth a thousand words so let me show you an example. The chart above is the daily chart of Apple. I have drawn two uptrend lines on the chart. The first one is from May to June and the second one is from July to September. A trend line is just a simple line that connects as many lows as possible. Up till this day there are many ways to draw a trend line. There is no right way or wrong way. Different traders will draw different trend lines. There is just a small difference. If you draw it correctly, you will eventually notice that your trend lines and the trend lines that other traders draw have only slight differences. So don't worry too much about them. After a bit of experience drawing trend lines, you will begin to draw better and more accurate trend lines. Which one it means will depend on how the stock behaves after it breaks the uptrend line. They happen in sequence. When a stock that is in an uptrend breaks an uptrend line, the trader should know that at the very minimum, the bullish momentum is slowing down. Some stocks can break an uptrend line and then move sideways. The sideways consolidation is a period of rest before moving higher. So, if a stock breaks an uptrend line, do not panic. Just know that the bullish momentum has slowed down. In the next few trading bars, you need to monitor the stock carefully to see if it can trade sideways. If it consolidates and trade sideways, you should accept that the bullish momentum has just slowed down. The stock will eventually break out higher. 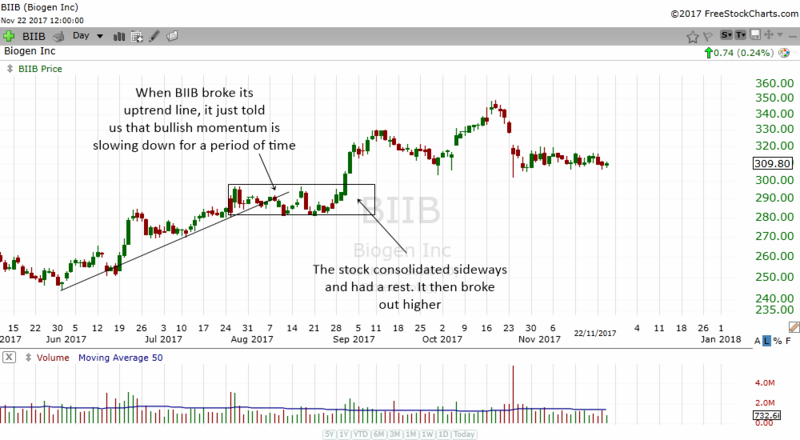 In the chart above, we can see how BIIB broke an uptrend line. However, the stock merely traded sideways without correcting. It formed a consolidation which it eventually broke out of. So you see, not all breaks of an uptrend line warrants a correction or a change in trend. Some break of trend lines merely suggest that the bullish momentum is slowing down so that the stock can pause to take a rest before resuming higher. Sometimes, the breaking of an uptrend line will result in a deep correction for the stock. Which is why it is important that traders monitor the stock very closely the moment it breaks an uptrend line. Do not take things for granted and hope that the sideways movement is a period of rest. 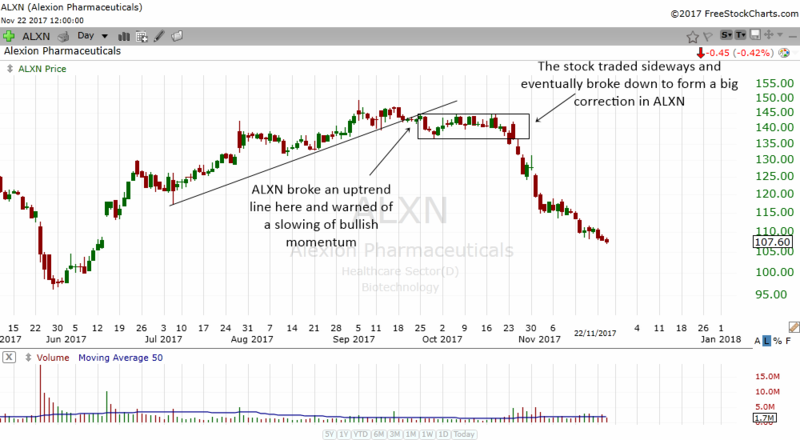 In the chart above, ALXN broke an uptrend line and traded sideways. The sideways consolidation was pretty weak as the stock traded sideways below the uptrend line. Eventually the stock broke below the consolidation box and this pointed out to us the stock is in for a deep correction. From around $140 ALXN dropped to $107.60. If the trader have paid attention to the breaking of the uptrend line as well as breaking below a consolidation, they could have avoided the steep loss. They might have even shorted the stock. Breaking of uptrend lines do not necessarily mean the stock will correct non stop. Sometimes it may just be a temporary correction before the stock resumes higher. 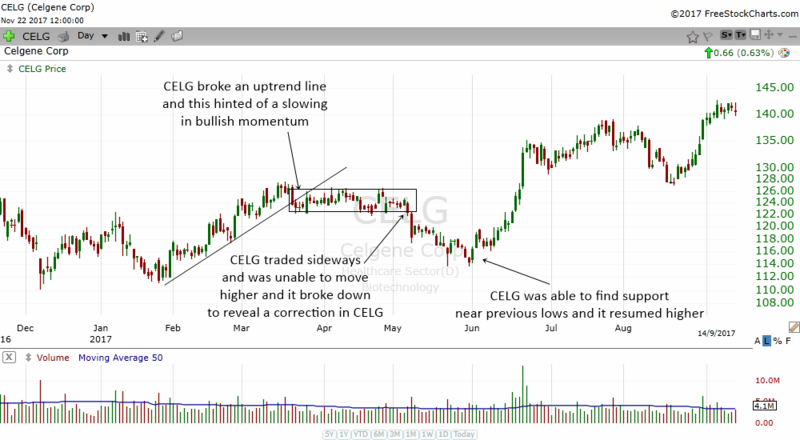 CELG broke an uptrend line. It then broke below the consolidation and corrected until nearing the previous low. The stock was able to find support there and then it resumed higher. But those who were holding the stock could have avoided that time consuming correction if they had notice CELG breaking the uptrend line. Major bear markets in stocks will often begin with the breaking of a long term uptrend line. When we say long term trend lines, we refer to the weekly trend lines as well as the monthly trend lines. You should really pay attention if your stock breaks a long term uptrend line. The odds of a big correction will happen is very high. The odds of a bear market or big crash in the stock is also very high. In the chart above, I have drawn two trend lines. 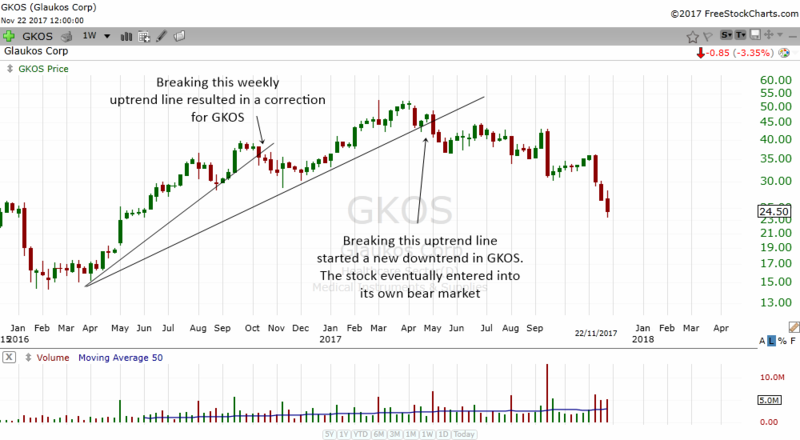 GKOS broke below the first trend line in October 2016. Although the stock only corrected to support area, because this is a weekly chart, the correction can be considered a big correction. To see a stock drop from around $37 to below $30 can be terrifying! A stock that drops more than 20% can be considered to be in a bear market. Its only in hindsight that we call this drop a correction. The only reason is because it bounced off support to resume moving higher. The second time the stock dropped below another trend line resulted in the stock starting a bear market of its own. The stock made lower highs and lower lows in the weekly chart. It was never able to go any higher and it begin a downtrend which still has not ended yet. Investors who did a little trend analysis would have been able to avoid the fall from around $42 to $23. When a stock breaks a weekly uptrend line, its always important to pay attention. 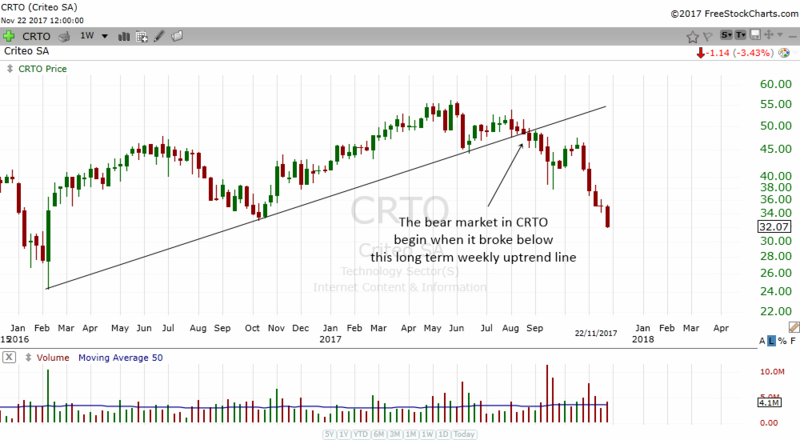 Take a look at the weekly chart of CRTO. It had a nice run up in the first half of 2017 but in August 2017, it broke a long term weekly uptrend line. In just a few months, the stock dropped from around $50 to $32 wiping off a lot of profits from investors. If you study history, you will realize that the last two big bear markets happened after the S&P 500 broke below a monthly uptrend line. It is amazing how just a simple trend line can warn us of stock market crashes. Stock market crashes do not happen overnight. The market tends to give us lots of warning before it collapses. The chart above is the monthly chart of the S&P 500 Index. Using a monthly chart, we can see the 2 big stock market crashes in recent history. The first one is the 2000 tech bubble and the other one is the 2008 stock market crash. If you draw trendlines across the prices, you will notice how the S&P 500 broke an uptrend line before those crashes happen. The S&P 500 broke a monthly uptrend line in late 2000. After that, the markets started to tumble. 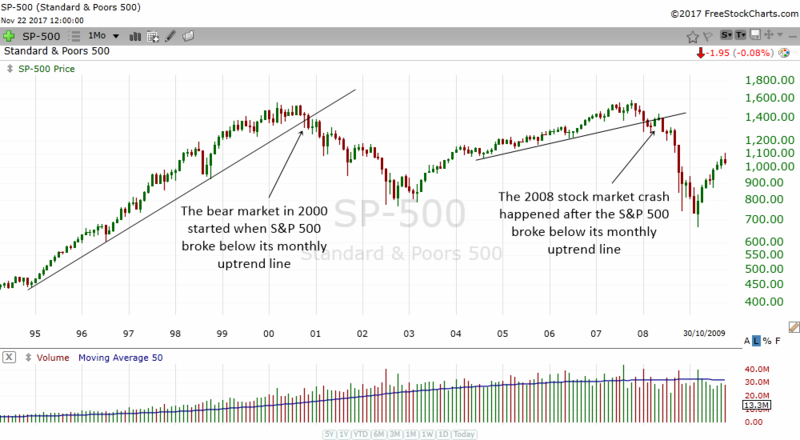 Then in early 2008, the S&P 500 broke another long term monthly uptrend line. The markets proceeded to drop furiously after breaking the long term uptrend line. It is always good to use trend lines to study and analyze the major indices. You might be able to stay away from the markets before it starts to crash. While the breaking of a trend line looks simple, nevertheless it is a very powerful technical concept that many experience traders will observe. From now on, start to use the trend lines. Learn to draw them, learn to spot them and learn to use them. This simple trend line will help you a lot in your trading and investing.